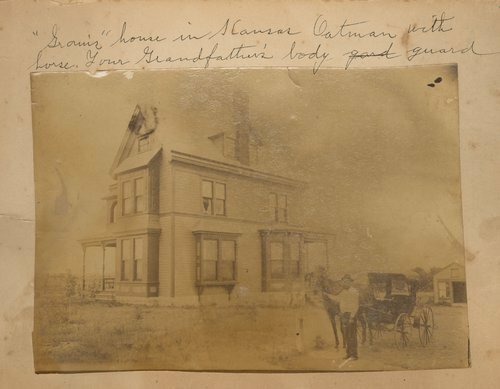 This is a photograph of Colonel John Edmund and Josephine Benedict Yard's house in Hays, Kansas. It was located near the corner of 19th and Elm Streets. Col. Yard, who was commander at Fort Hays, died before the house was completed, but his wife and children lived in it for a time until they moved to New York. In the photograph, Mr. Oatman, Colonel Yard's bodyguard and later his butler, is shown standing with a horse and carriage. The house was razed in January 1937, and an article about it appeared in the Hays Daily News on January 23, 1937.